What better way to get down from a climbing frame than on a slide? Those precious moments when you hear gleeful cries of “wheeee!” as your child comes down the slide, only to run straight back up the ladder, are quite simply priceless. Slides are available in short or long and are available in many different colour combinations including yellow, blue, red, green and pink. These robust climbing frame accessories are the perfect slides for climbing frames. The Star Short is ideal for the Jungle Castle or Jungle Club towers or similar towers with a platform height of 125cms and the Star Long works well with the Jungle Barn and Jungle Palace towers or similar towers with a height of 145cms.The Star Slide is made from durable high-density polyethylene plastic which is designed to be resistant to UV rays meaning it will not fade in the sun. If your kids like to play cops and robbers or goodies and baddies, the best and fastest way to make their escape is down the slippery slide. Creating hours of enjoyment for your children, the Star Slide could just add up to your child’s perfect Summer. 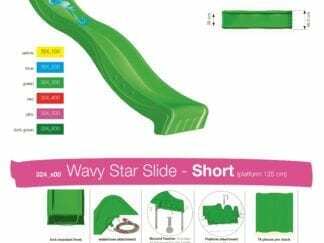 Climbing up and sliding down is not all you can do with this water slide, suitable for smaller spaces, these children’s garden slides have a special feature. 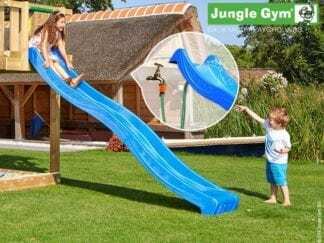 When the British weather finally hots up and you need a safe way for your kids to keep cool, a special adapter on the back of the slide allows you to connect your garden hose so that you can turn a garden slide into a water slide. Just imagine the fun they will having sliding down a plastic water slide on those hot, sunny afternoons! 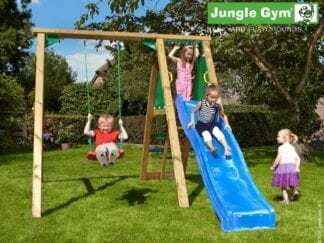 The free-standing Peak Swing and slide set is also great value. It is constructed of timber frame and is provided with ground anchors for safety.